Vasilij Romanenkov was born in 1953 in the small isolated village of Bogdanovka. At the age of fifteen, he moved to live with his relatives near Moscow, where he was first trained as a cabinet-maker and then, at the age of seventeen, began to work at construction sites as a builder. He started painting at the age of twenty-two and for several years attended consultations with Rotanov, a teacher-artist. 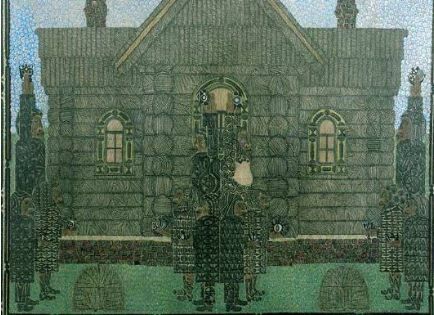 Romanenkov’s pencil drawings, sometimes tinged with colored ink and always framed by rich borders, are complex representations of village and--in his most recent works--town life. Having been transplanted to the city at an early age, Romanenkov idealizes the country he left as a teenager. Scenes of rural life comprise most of his oeuvre; themes include haymaking, births, marriages and funerals, and many take place against a background of churches and wooden houses. The images, reminiscent of Russian icons, are heavily laden with both secular and religious symbols and spiritual overtones. Love for the village is apparent in even the tiniest details of his works. Referring to a series of recent works called The Town Life, Romanenkov says that the symbols on the figures’ clothing are the “dreams of peasants who have to work in the town.” Romanenkov currently lives in Moscow and works as a parks gardener.